Researchers from University of Minnesota, Twin Cities have been working with a team of researchers led by Professor Sangeeta Bhatia from MIT to successfully develop a novel approach to diagnostic testing for non-communicable diseases, such as cancers and cardiovascular diseases. The traditional diagnostic tests for cancers or cardiovascular diseases are stressful, time-consuming and expensive because these tests lack of reliable and easily detected biomarkers that signal the presence of diseases or conditions. The groundbreaking diagnostic test that was developed by the researchers at the University of Minnesota has only two steps. After an injection of iron nanoparticles, a urine test that uses paper strips, which look like those found in a home pregnancy kit, will be used for detecting the biomarkers for the cancer or other condition. Researchers found that both tumors and clots contain elevated levels of certain enzymes. In clots, the enzyme thrombin is elevated and cleaves a protein in order to release the “building block” molecule of clots; in tumors, a certain type of “protease” enzyme is elevated and cleaves a different protein that acts like a mini-machete to help release cancerous cells into the bloodstream. Researchers combined two molecules into the iron nanoparticles, which would act as a “messager” to tumors and clots. One molecular was a synthetic analog of the protein or the enzyme of tumors and clots. Connected to it was the second synthetic detecting molecule, which would be set free to signal the presence of tumors or clots and would end up in the urine. After injecting the iron nanoparticles into the mice, the researchers collected their urine and exposed it to strips of nitrocellulose paper coated with antibodies. As the urine flowed along a strip, it encountered strips containing antibodies that recognized tags associated with the second molecule. If any strip became visible, it meant tumors or clots were present. This novel approach of diagnosis of tumor or cardiovascular disease gives doctors an advantage to diagnose easily and earlier. It is also a cost-effective way for patients to spare them from an expensive MRI. Many of the materials in this diagnostic test, including iron nanoparticles, have been approved by U.S. Food and Drug Administration. University of Minnesota, Twin Cities has been planning to perform clinical trials and commercialize the technology. These cutting edge research programs make the University of Minnesota one of the leading research institutions in the nation. Researchers at the University of Minnesota are eagerly looking for the newest products and technologies to fully develop their research. Over the past five years, inventions from the University of Minnesota researchers have generated nearly $274 million in revenue for the state of Minnesota. University of Minnesota Twin Cities is also a richly funded marketplace. The University has received 606 grants and awards of over $263 million from the National Institute of Health in 2013 in addtion of 179 grants of $67 million as of April 24th 2014. 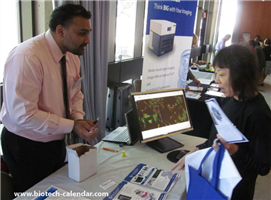 Biotechnology Calendar, Inc. helps laboratory supply companies to get their products and technologies into the UMinn’s laboratory by providing an opportunity to gather lab supply companies and researchers together at the UMinn Twin Cities BioResearch Product Faire™ Event. The next event will be held on May 20th 2014. Last year, the UMinn Twin Cities BioResearch Product Faire™ Event has attracted 372 attendees who are from 33 different research buildings and 52 on-campus departments. Of these attendees, 27% were purchasing decision makers and 14% were lab managers. If you are a laboratory company and would like to demonstrate your newest products to researchers at the University of Minnesota, Twin Cities, please click this button to get more information about the UMinn Twin Cities BioResearch Product Faire™ Event on May 20 2014. 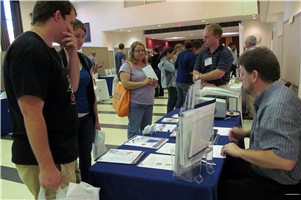 If you would like to exhibit in more events at different BioResearch Product Faire™ events at different institutions throughout the country, please view our National Show Schedule for 2014.